Lucie began working as a Chef on luxury yachts travelling around the Mediterranean and Caribbean delivering top quality food to private clients. Sailing the sea from country to country influenced and widened Lucie’s knowledge on food, flavour and techniques, enhancing her repertoire. 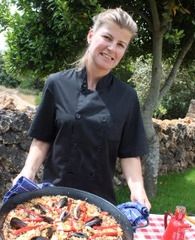 Lucie has now brought her culinary skills ashore and travels between villas and yachts cooking for clients. Food found around the Mediterranean is light, deep in flavour, bursting with colour, prepared with ingredients which are local, fresh, simple and healthy.